An incomplete circular copper-alloy unidentified object of unknown date. Consisting of a flat circular plate with a central circular hole. The internal face is worn in places, possibly through wear. On the back face are two parallel rectangular projections. These are 4.80mm in length, 5.56mm in width, 1.97mm in thickness. Through the centre are separate circular copper-alloy rivets, which connect the projections to the plate. On the front face where the projections connect with the plate are two parallel circular marks, which have a distinct pale green colour. 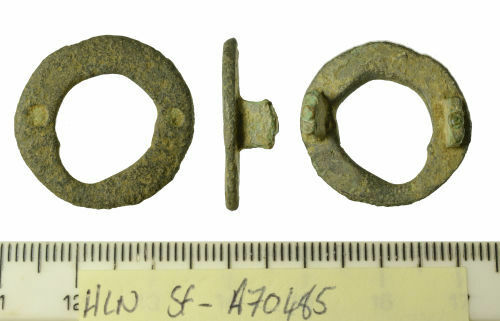 These may be the remains of copper-alloy roves. This unidentified object measures 23.03mm in external diameter, 12.04mm in internal diameter, 2.14mm in thickness, 4.29g in weight.